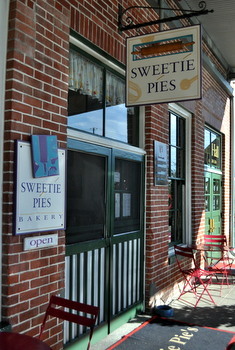 Sweetie Pies is an adorable bakery on the Napa riverfront that specializes in American classics, like cheesecakes, cupcakes and cream-filled whoopie pies. The place is busy and if you sit inside for more than a few minutes, you’ll see quite a few people come through the doors and leave with goodies. One of their signature items is the Yodel. 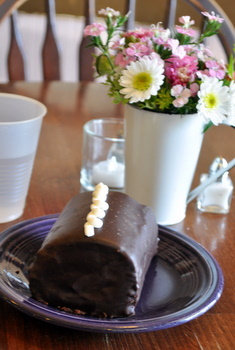 A Yodel is a cream-filled chocolate roulade snack cake made by Drake’s snack cake company (now owned by Hostess). You might not have seen it if you live on the west coast, but it is a lunchbox snack that will definitely be familiar to anyone from back east. I’ve had the classic snack cakes and couldn’t resist trying the specialty version. The yodel at Sweetie Pies is huge – easily big enough to split between 2-4 people, depending on how hungry you are or how much sugar you want in your system. 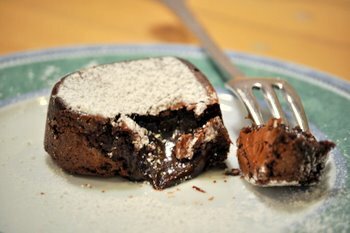 It consists of a flourless chocolate cake that is rolled around a thick marshmallow cream filling and glazed with dark chocolate. The bakery also makes a red velvet version called a Rodel. The super sized snack cake is very moist and chocolaty, but also very sweet. I couldn’t finish one with two people even though it was quite tasty! Fortunately, the people at the bakery were kind enough to box up my leftovers so I could the rest of the cake to go with me. I have to admit that I wouldn’t order one of these for myself again simply because I wouldn’t be able to finish it and it’s hard to find a place to store a chocolate cake when you’re traveling (not all hotels have refrigerators, although mine did). I do think that they’re a really tasty, fun treat and a great dessert for sharing with friends – as well as a great treat to bring home to friends and family who weren’t able to make it to Napa with you. The bakery makes a limited number every day and I hear that competition can get fierce for them on the weekends, so you might also want to stop by early in the day, although their other treats look every bit as good so I’m sure you’ll find something even if you don’t score a Yodel on the first visit. Oh kinda like a swiss roll. 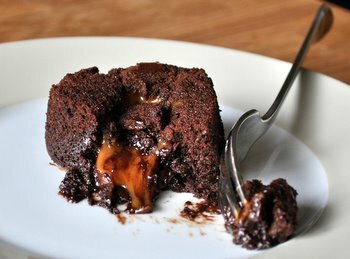 You can make those flourless too. YUM! I love the name Sweetie Pies! You really should go to Bouchon Bakery in Yountville-much better than Sweetie Pies! Also, a great locals restaurant to try is Fume. It’s always yummy! Thanks for giving such great reviews of my home town! 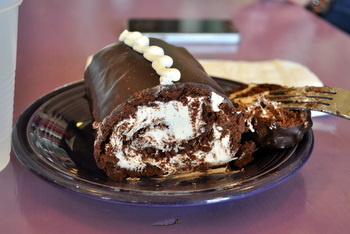 A giant swiss cake roll! My husband would swoon at this.